Ridiculous Blindfolded Chiang Mai Muay Thai Fight! 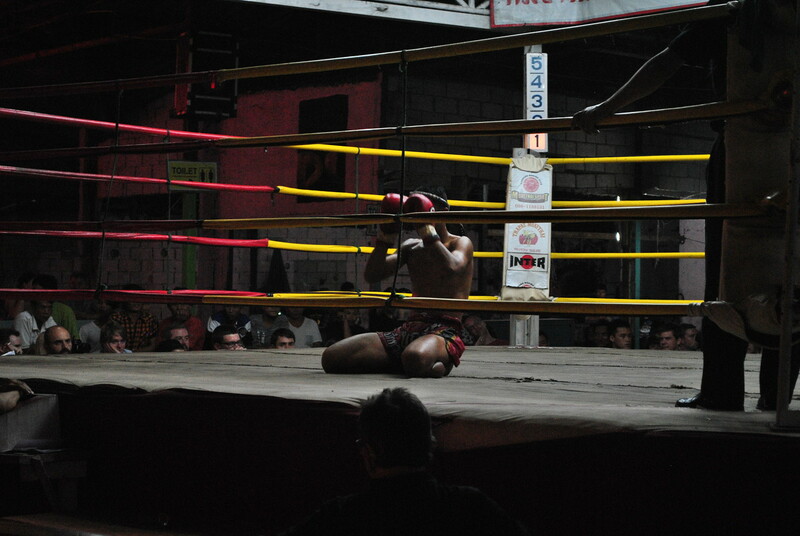 Chiang Mai Muay Thai Fight…Blindfolded! One of the most unique wedding presents we received was a night of Muay Thai fighting in Chiang Mai, and when we found out there was a Muay Thai ‘stadium’ next door to our guesthouse, we just had to check it out! We arrived at 9pm and got a copy of the programme – it turned out there were a number of fights on that night, culminating in the headline fight of the night. So we settled into our plastic seats, and awaited the first fight of the night. This turned out to be the first of two female fights we witnessed. Not much of a boxing fan myself, I was initially quite disturbed by the young girls sinking kicks and punches into each other, especially as they looked to be only around 16 years old and not that much stronger or heavier than the average teenager. It surprised me how much I was drawn into the fight through the intensity of the venue, the people and the atmosphere. The first few rounds felt as if I was taking every blow, constantly shifting in my plastic seat and sweating as the adrenaline kicked in – and I was just watching! After the initial shock wore off, I realised I had chosen the girl in the blue corner, and began cheering her on! What came next was four gruelling rounds of locked bodies, snappy kicks and wild punches. At the end of the match, I celebrated when blue had succeeded in a final blow to take down red. I was, however, left a little numb and concerned for the red girl, but she recovered just enough to stand up and gracefully congratulate the blue girl. After that I blew a sigh of relief. It was then I realised I was well and truly hooked in this new sport and ready for the next fight! 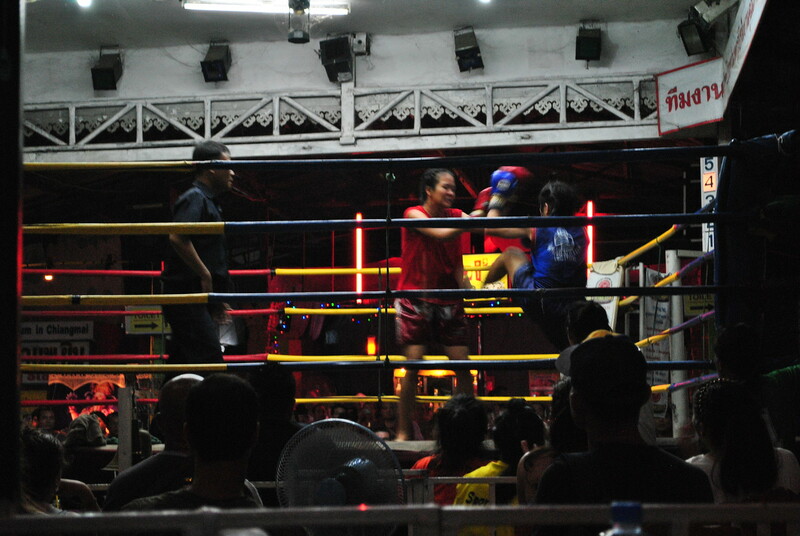 The atmosphere in the dingy stadium that surrounded us was electric and full of excitement from the supporters and intrigued tourists clearly witnessing Chiang Mai Muay Thai kickboxing for the first time. Like me, they were intrigued to see more. After the initial fight, we were excited to see who was next and choosing who we were going to support. The moments before the start of each fight were arguably the most interesting, as each fighter performed a lengthy pre match ritual. On came the deafening traditional music, building the tension and suspense in the crowd. Each fighter would make their way around the ring, performing their own ritual dance in preparation for the fight – they always looked so graceful until the first ding of the bell! 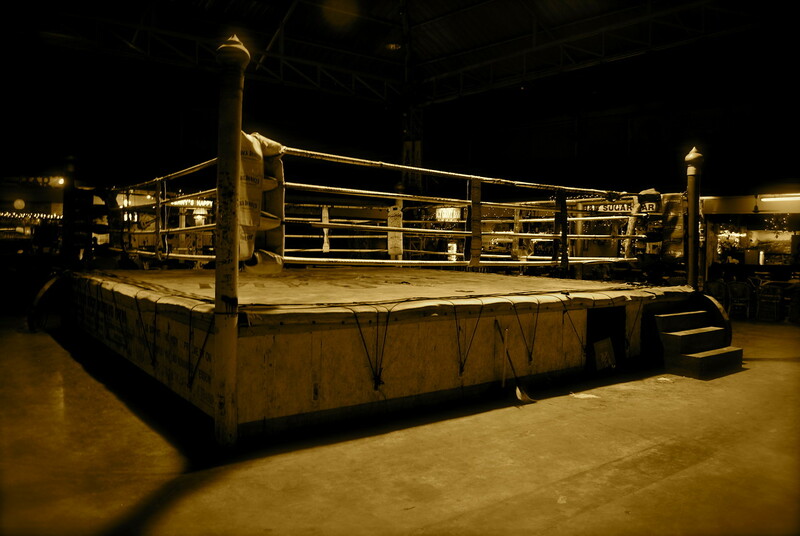 What followed was a mix of fights from young boys fighting, to a full blown fight between two women, to a fight involving 8 blindfolded fighters all in the ring at the same time. Easily one of the most peculiar sights I’ve witnessed. Despite this comedy fight, all the other fights of the evening were genuine, full blooded affairs (sometimes quite literally!). Some evidence of the most experienced and brutal fighters of the night… Have you ever attended a Thai kickboxing fight before? What did you think? Did you enjoy it or find it all a bit too much? Let us know below! Book Your Train/Bus/Ferry/Flight Tickets Online! We always recommend that you book your journey in advance, so you have peace of mind that your seats are booked! We recommend using 12go.asia as they offer train, bus, flight and ferry ticket booking online in advance! Check out your journey options and prices here and get your seat reserved! That video is absolutely hysterical!! I loved the guy with the windmill spins for his attacks. What an experience, definitely put Kickboxing on my list of things to do/see when in Thailand, thanks for the great idea! It certainly was an experience Kyle! Aside from the weird blindfolded fight, the rest were pretty strong fights. We’d recommend going to a Thai kickboxing night if you get the chance! Well yet again you’ve had me in stitches over the 8 blindfolded boxers!!!! You couldn’t make it up! How do they decide who won? I’m enjoying every minute of your trip with you. So pleased I am in the comfort of my home. I don’t think I could do what you are doing but love the blogs and pictures. What amazing places you get to. So glad you’re enjoying the blog, especially the funny situations we find ourselves in! It’s not always comfortable, but we love it – glad we can give you a taste of what its like from the comfort of your home! Hehe, thanks Leanne – luckily we paid for the cheap seats so avoided the blood, sweat and saliva! I’m sure they were just as intense in Braehead! Hi, I came across your blog while googling muay thai in Chiang Mai. I’m headed there next month and am hoping to catch a match. 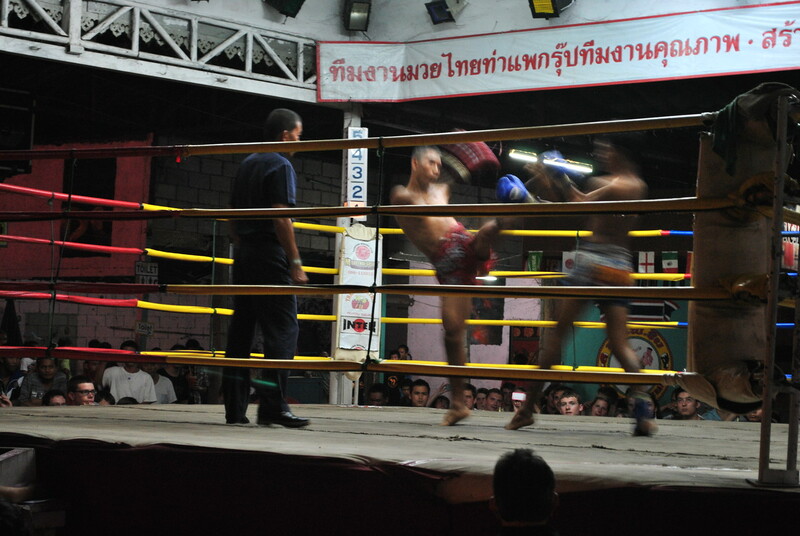 I hear that a lot of the matches in Chiang Mai are put on for tourists rather than real fights. So I was curious where you saw the match and whether there were locals at the venue also besides the tourists. Did it seem authentic? Thanks in advance! We went to the boxing arena next to Thaphae Gate, at the Thaphae boxing stadium. Seemed legitimate to us, particularly the female fights!